Much has been written lately about the strategic value that design can add to organizations of any scale and type. The European Commission’s “Innobarometer” aggregates multiple surveys of the effects of design on innovation. Simply put, design is a method of problem solving. Whether it is an architectural blueprint, a brochure, the signage system at an airport, a chair, or a better way to streamline production on the factory floor – design helps solve a problem. The value of design is difficult to define. Design is hard to isolate as a function and the design function operates differently by industry. That makes benchmarking to standardized measurement metrics difficult. 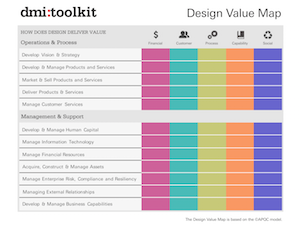 Instead, DMI chose to look at the value of design-focused organizations as an aggregate. 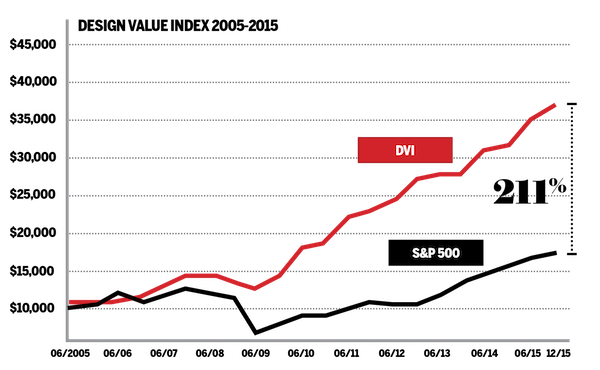 In 2013, DMI and Motiv Strategies collaborated to develop a market index that could be used to track how design-focused companies perform relative to the S&P 500 over time. 15 publicly traded US companies made the criteria for inclusion. The results supported a growing body of findings that good design drives shareholder value. 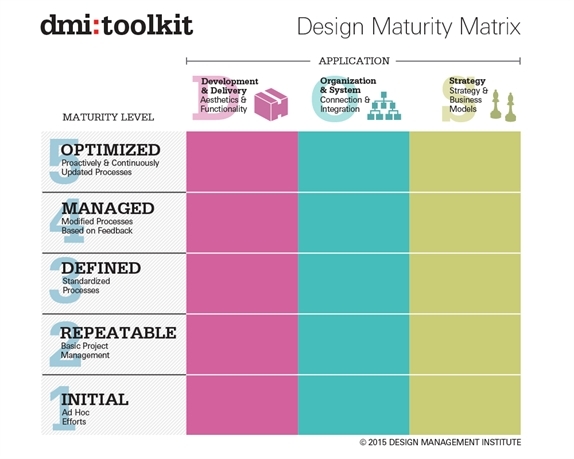 The Design Value System has three components: The Design Value Index, The Design Maturity Matrix and the Design Value Map. DMI and Motiv Strategies, funded by Microsoft, began analyzing the performance of US companies committed to design as an integral part of their business strategy. Completed in 2013 the dmi:Design Value Index tracked the value of publicly held companies that met specific design management criteria, and monitored the impact of their investments in design on stock value over a ten-year period, relative to the overall S&P Index. 2015 results show that over the last 10 years design-led companies have maintained significant stock market advantage, outperforming the S&P by an extraordinary 211%. The Power and Value of Design Continues to Grow Across the S&P that includes “Ones to Watch” a new list of design-driven companies to observe. Good Design Drives Shareholder Value that includes trends in design disciplines. Download a PDF of the dmi:Design Value Map based on the ©APQC model. Used in tandem or separately, the dmi:Design Value System provides valuable tools to communicate the value of investing in design, assessing the maturity of the design function in an organization, and benchmarking the functional areas in which design adds value.